Open up the Optimize panel to find tools for finalizing the flattening of only partially flattened shells. Change the locked status of all flattened shells. Locked shells can't be accidentally flattened, cut, welded or edited in any other way; they can only be moved, rotated and scaled. Use the L hotkey to toggle individual shells, or to box select a group of shells. Click on Run For to continuously flatten picked shells until they don't change any more, or until the timer runs out. If no shells are picked, all unlocked shells are optimized. You can increase the mins value to give it more minutes on complex meshes. Change the Map Rez setting so that UVLayout knows the pixel resolution of the map that you will be using with these UVs, and it'll use that to work out when to stop flattening a shell; if the change is less than a pixel, there's no need to optimize further. You can cheat here though, so if you want a less accurate but faster optimize, reduce the Map Rez setting. When a mesh is loaded as a SUBD surface, UVLayout moves the cage control points down onto the subdivision limit surface, and its this "knots surface" that you see and edit; under most circumstances this is enough to produce distortion free UVs for SUBD surfaces. There are certain shapes however where this approach doesn't work so well, and so Calc Subdivision Targets can then be used to compute a more accurate approximation of the subdivision surface; it can take a few minutes, so is not applied by default when SUBD surfaces are loaded. 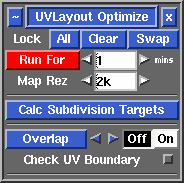 Pick the shells you want to apply this too, click the Calc Subdivision Targets button and wait for it to finish processing, then re-optimize. If no shells are picked, all unlocked shells are processed. Click the Overlap button to search for overlapping UVs. You might run the overlap check after an optimize, and possibly a repack, to confirm that all shells have flattened out completely. A window will pop up telling you how many overlaps have been found, and you can cycle between these with the blue left and right arrow buttons. Alternatively, when the overlaps are turned On, you can use the keypad left and right arrows key to move between them. Each overlapping area is highlighted with a yellow filled red outline, but you can turn this off with the Off button.